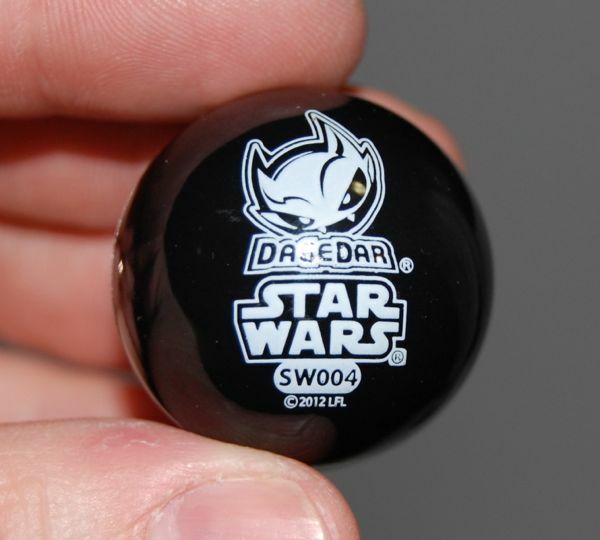 I don’t think I had ever heard of them before, but apparently Dagedar is an existing line of toys that is now adding a new Star Wars line (so they’re similar to Mighty Beanz in that sense). They’re kind of an unusual concept. 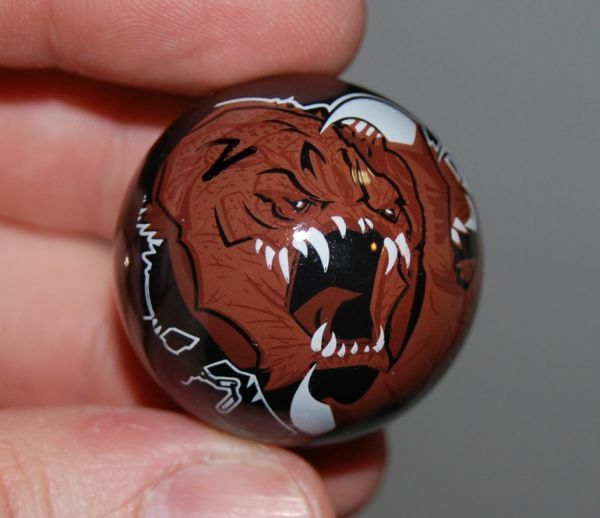 They’re basically plastic marbles with different Star Wars characters on them. According to their list of characters, there will be 100 different Star Wars characters available, including several from Jabba’s palace such as Jabba himself, a Gamorrean Guard, Han in Carbonite, and Skiff Guard Lando. They retail for about $6 or $7 apiece, so collecting them all would be a pretty major investment. They also have chips inside them that can be used with an audio decoder. With the audio decoder, you place a character on the device and it will play one of a handful of audio clips from that character (see video below). I always liked that feature with Hasbro’s Episode 1 action figures. It seems that the Phoenix Arizona area is a test market for this product, so a few of the racers are available on eBay through resellers, but for the most part they haven’t been released yet. Some of the accessories are available for preorder on ToysRUs.com, although their prices seem to be higher than the MSRP. 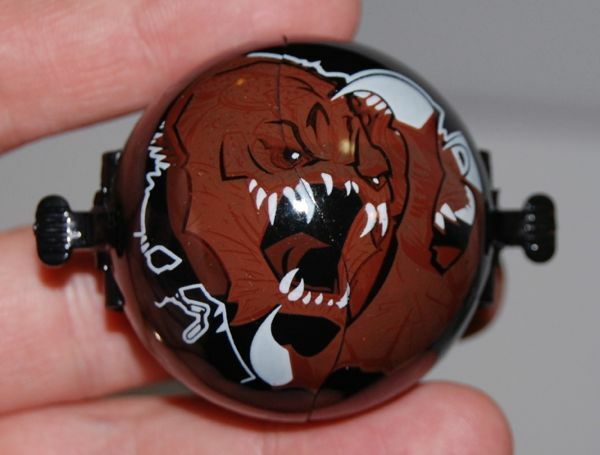 This one is the rancor, as you can see. I don’t yet have either of the decoders to try out the sound or video features, but I do have the audio one on order and will update this post when I get it. What you see in the package is actually an outer plastic case that is spring loaded (the package has a “try me” feature that lets you open up the case and see the actual racer inside). It’s kind of cool, but I’m not really sure why we need individual cases for each one. Seems like they might have been able to sell these a bit cheaper without the cases, but on the other hand it is handy to prevent the balls from rolling away when you have them on display. The racer itself is essentially a plastic marble. It’s got a nice weight to it, which I suppose is necessary if you want it to race around a track. It’s got the character artwork on the front and the “Dagedar” logo and series number on the back. I’m kind of intrigued by this line. On the one hand, I can’t help but think that it’s trying to do too much, combining the racing, collecting, audio and video features. The video decoder in particular seems to be quite expensive (around $60) for something that really doesn’t do all that much. But my son seemed pretty excited about them when I explained what they were, so maybe Cepia is on to something. At any rate, I’ll be getting the Jabba’s palace ones, and probably few other characters like C-3PO and R2-D2.